This bowling game is ideal for indoor use and the pirates stand up easily on good sized bases. 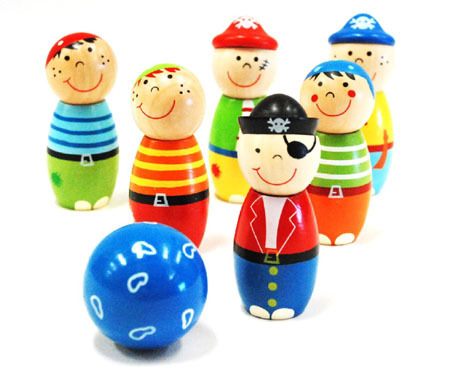 A great hand eye co-ordination game bowling is a lot of fun and these little pirates are made from quality wood and are very detailed. Size: 9 cm tall Ball has 4.5cm diameter. We like this because: "Simple and fun game that really engages young children. " Hi Doug & Co Have received an order I placed just a little while ago. I was amazed at how quickly it got here. This is the best online customer service I have ever had experience with. Great communication from you too letting me know when parcel was sent. The toys are wonderful. Got the Pop-up Pegs and the Cog Stacking Blocks and the little Pullback Plane. My grandson, Rain, turns one next week. Can’t wait to show him the pop-up pegs....he will just love them. I am keeping the plane here for when he visits because my husband just loves that plane and it is sitting on his desk now.....so it has become a household toy. And I'm giving Rain the cogs later in the year. Thanks again and I’m so happy and satisfied with the products and service. Have a great everything.